It's the partnership of your dreams. A match made in heaven. And you might have the state labor department to thank for it. A new job matching software is taking cues from the incredible success of online dating, trying to match those seeking employment with a suitable job. The Department of Labor in Albany is spending about $140,000 in federal funds to experiment with the software, called Smart 2010 (short for Skills Matching and Referral Technology), which goes beyond searching for keywords in a résumé and tries to find contextual clues about the applicant’s skills and interests, The New York Times reported. The state has a database of about 70,000 available jobs, about 30,000 of which were posted in the last week, Leo Rosales, a spokesman for the Department of Labor, told the Times. More than 850,000 New Yorkers are out of work following the financial meltdown and ensuing recession -- and state labor employees, turning to a private software developer in Boston -- hope the new technology will help land people back in jobs. Oh, and jobs they actually like. Labor officials call the program, developed by Burning Glass, a "holistic approach" to finding a job match. It's based on "the entire person -- their strengths, skills and talents." Sounds a little, too, like finding the right yoga practice. But labor officials have high hopes, even if the first matches were not a raging success. The Times points to the story of Danielle Lazzaro, 24, who was laid off from her job in marketing several months ago and embarked on a fruitless job search. She signed up on the SMART program and after digging deep, the program spat out two -- yes, two -- possible matches. One was far out of her range of qualifications. The other had the Queens woman commuting to Buffalo for a clerical position. “I thought that I was going to get a lot more results, more than two obviously,” she said. “I was a little disappointed. I was really hoping it would point me in another direction," she told the Times. But even the early days of Match.com was fraught with such difficulties, right? New York is only the second state to offer the service (after Minnesota), labor officials there say the are "very pleased" with the SMART program. 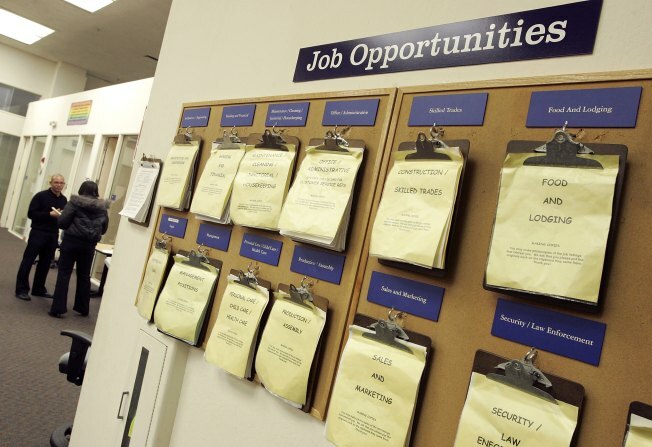 Also, after surviving a crippling recession, unemployment lines and insurance woes, most job seekers might be happy to have a paycheck for a while, officials surmise. Rosales summed it up this way: with tens of thousands of New Yorkers having exhausted their unemployment benefits, and job seekers outnumbering openings six to one, some may have to lower their sights, he told the Times. Don't do that on Match.com, though.